The Nestle Nutren Pulmonary Complete Nutrition Vanilla 250ml Case of 24, Model #9871616480, is anchored in advanced science and research. Nestle Healthcare Nutrition offers nutritional solutions for people with specific dietary needs related to illness, disease states or the special challenges of different life stages. 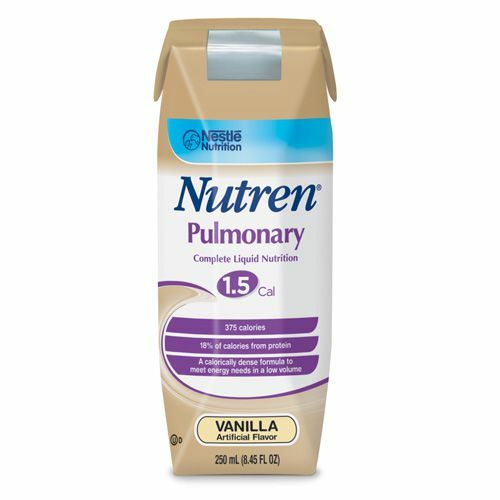 The Nestle Nutren Pulmonary Complete Nutrition Vanilla 250 ml Case of 24 is for people with chronic respiratory disease, lowering the amount of carbon dioxide (CO2) they need to exhale is important. Nutren Pulmonary is designed with a carbohydrate and fat proifle to help reduce carbon dioxide production. For use under medical supervision. Designed with a carbohydrate level to help reduce CO2 production and respiratory quotient. Calorically dense to meet elevated energy requirements in low volume. Balanced lipid profile with MCT to facilitate tolerance. Ingredients: Water, Maltodextrin, Calcium-Potassium Caseinate (from Milk), Medium Chain Triglycerides (from Coconut and/or Palm Kernel Oil), Canola Oil, and less than 2% of Corn Oil, Soy Lecithin, Calcium Citrate, Magnesium Chloride, Potassium Phosphate, Potassium Citrate, Sodium Phosphate, Salt, Sodium Citrate, Choline Chloride, Citric Acid, Sodium Ascorbate, Magnesium Oxide, L-Carnitine, Taurine, Carrageenan, Alpha-Tocopheryl Acetate, Zinc Sulfate, Ferrous Sulfate, Niacinamide, Calcium Pantothenate, Vitamin A Palmitate, Manganese Sulfate, Pyridoxine Hydrochloride, Copper Sulfate, Riboflavin, Vitamin D3, Thiamine Mononitrate, Folic Acid, Biotin, Sodium Molybdate, Potassium Iodide, Chromium Chloride, Sodium Selenate, Phytonadione, Vitamin B12.